Life as Wednesday’s bodyguard, driver, and errand boy is far more interesting and dangerous than Shadow ever imagined—it is a job that takes him on a dark and strange road trip and introduces him to a host of eccentric characters whose fates are mysteriously intertwined with his own. (Book description from Goodreads). Gaiman’s books always leave me with a feeling of melancholy, as if, for a brief moment the veil has been lifted and I see the inner workings of the world around. I am forever changed. I love this feeling. Posted in Books, Magical Realism. Tagged books, Neil Gaiman. The only book I’ve read by Gaiman was The Ocean at the End of the Lane, and after I finished it, I had no idea how to write a review for it. Such a lovely story that left me speechless. 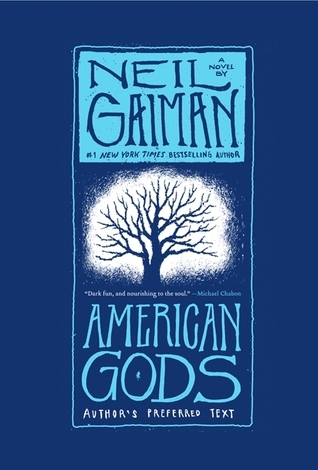 American Gods, though, is the book that everyone tells me I HAVE to read by him. I find it difficult to review most all of Gaiman’s books. They all move me on a very deep level and it is difficult to translate that felling into words. I really think you’ll enjoy American Gods.